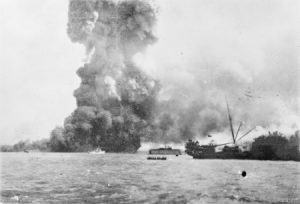 The Japananes bombing of Darwin. In this photo - oil rigs. On 19 February 1942 the Japanese attacked the mainland of Australia for the first time consisting of two air raids on the city of Darwin. They were planned and commanded by the same commander that led the attacks on Pearl Harbor. 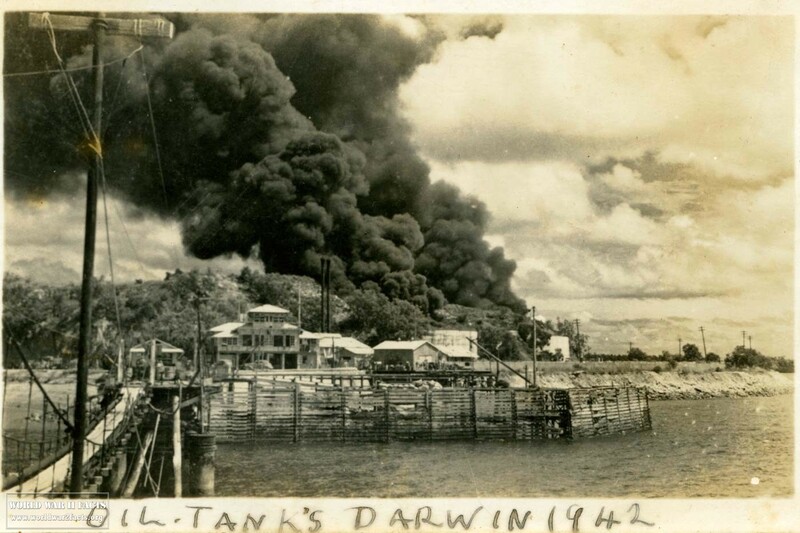 The Battle of Darwin, or attack on Darwin was attacked using 54 bombers and another 188 attack planes that were launched from aircraft carriers in the Timor Sea.. In the first part heavy bombers attacked the harbor and town while dive bombers that were escorted by Zeros attacked ships near the harbor and airports. The first attack was over after just 40 minutes, an hour later the second attack started, this time from high altitude, it's objective was the destruction or the Royal Australian Air Force base, the second attack was over after about 25 minutes. Over 243 people were killed and another 300-400 were wounded during the two attacks in the initial phase of the Battle of Darwin. The military lost 20 aircraft and 8 ships were sunk and yet the worst part, except the loss of human life of course, was the almost complete destruction of Darwin. The explosion of an oil storage tank and clouds of smoke from other tanks, hit during the first Japanese air raid on Australia's mainland, at Darwin on February 19, 1942. In the foreground is HMAS Deloraine, which escaped damage. Contrary to popular belief at the time, these attacks weren't the first wave of an upcoming invasion, rather it was a preventive strike planned by the Japanese. At the time the Japanese wanted to invade Timor, Darwin would have been the most likely place from where the Allies would launch a counter attack, to prevent this the Japanese attacked Darwin first, the attack also had the goal of lowering the morale of the Australians. Because of the fall of Singapore only a few days before the attack on Darwin, the Australian government was concerned about the national morale so they announced that 17 people had died in the attack instead of the actual figure of 243. The SS Neptuna explodes at Stokes Hill Wharf, sending a column of debris and smoke hundreds of metres into the air. Directly in front of the explosion is the small Patrol Craft HMAS Vigilant which is undertaking rescue work. In the centre background the floating dry dock holding the Corvette, HMAS Katoomba is visible. In the centre foreground a lifeboat pulls away from the damaged SS Zealandia (right) which was dive bombed and later sunk. population. While it is true that the confusion of the attack lead to some of the military leaving the town, one also has to remember that many of the military personnel that were both on the land and on the ships stood bravely in their positions while the enormous Japanese air fleet attacked the mostly defenseless town. One example of such bravery were two Australian soldiers who were awarded with medals of courage under fire for their actions during the attack. Frederick Wombey was an anti-aircraft gunner who stood his ground and guarded vital naval oil tanks at Darwin harbor, thanks to his actions and courage the oil tanks were saved. Wilbert Hudson, despite being under fire from Japanese planes maintained fire on the them until he was out of ammunition. Without taking the size of the targets into account many have compared the first attacks in the Battle of Darwin to the surprise attack on Pearl Harbour that happened just a few weeks before the attack on Darwin. This shouldn't come as too much of a surprise when the commander of both attacks is considered, it's the same person, Commander Mitsuo Fuchida. It is evident in both cases that the military didn't respond quickly enough to defend themselves and their respective bases. Both at Darwin and at Pearl Harbor there was warning of a large number of unidentified aircraft heading their way but it was ignored by air force personnel. Australia's military apparently hadn't learned anything from the attack on Pearl Harbor weeks before the Battle of Darwin. 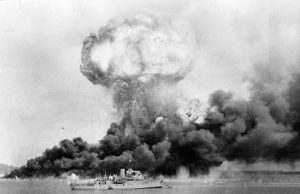 The Japanese continued bombing Darwin until 12 November 1943, a total of 60 times. During all of these attacks the Japanese only suffered the loss of 7 planes and those were shot down in the first two raids. Later in the war, Darwin had proper air defenses and this lead to much greater losses for the Japanese. To this day the exact number of people killed in the first two raids of the Battle of Darwin isn't exactly known. In 1942 it was set at 243 dead. One solider claimed that barges full of bodies were towed out to the sea, and that in the end there were more than a 1,000 dead. These claims are disputed because of the relatively low number of wounded, if the number of deaths was so high it would stand to reason that there would be many more injured. In any case, both the attack on Pearl Harbor and the Battle of Darwin horrific examples of what kind of role the element of surprise has in warfare. ABC Bombing of Darwin Audio Tour, Last Viewed 04 December 2013. City of Darwin Bombing Resource Page, City of Darwin, Last Viewed 04 December 2013. 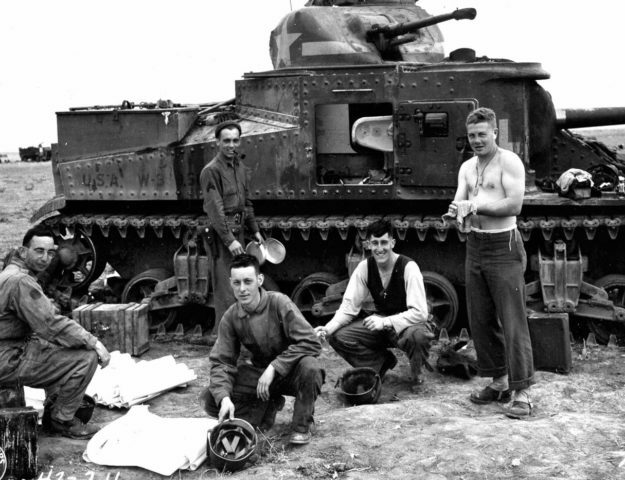 Northern Territory World War 2 Resource, Last Viewed 03 December 2013.